Fred Gardner’s artwork is on exhibit at the opening of the East Amwell Museum in Ringoes, N.J. The exhibit includes about 50 of Fred’s paintings, mostly watercolors, plus 24 Christmas cards, which he has created each year since 1994. 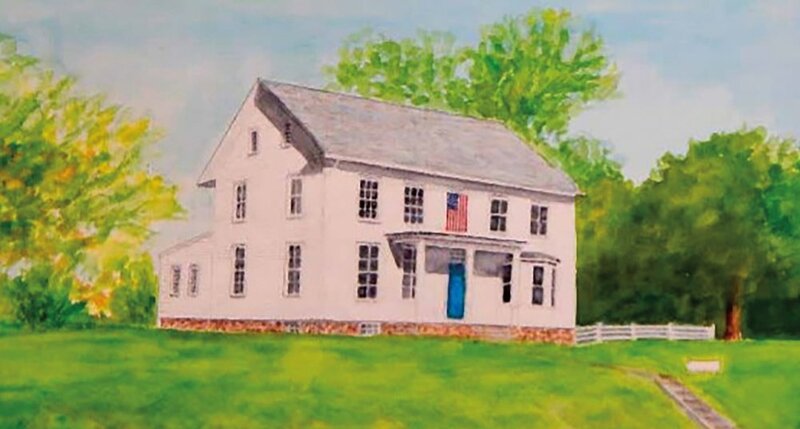 To help celebrate the opening, Fred painted a portrait of the Clawson House, which will permanently hang in the front hallway of the building. The show’s catalog, which also includes poems by his wife, Gael, can be downloaded at: www.eastamwellhistory.org/museum-opens-with-exhibition-by-fred-gardner/. 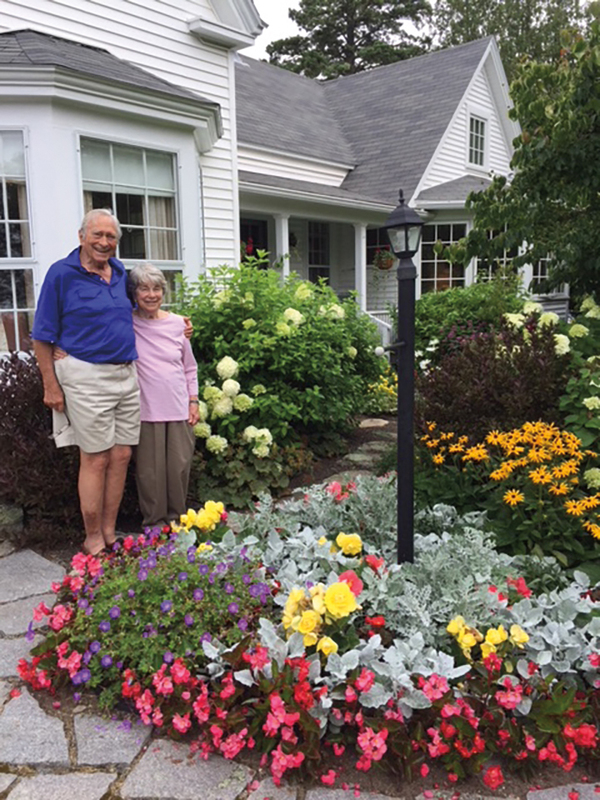 Louisa and Bill Newlin ’51 at their home in Maine. A portrait of the Clawson House by Fred Gardner ’51, on display at the opening exhibit of the East Amwell Museum in Ringoes, N.J.
Mark Cluett ’51 shares this photo from the wedding of his daughter, Julia, to Bob Shepley ’72. (L. to r.): Claire Stanton ’11, Zoe Stanton ’20, Bob, Mark, Elizabeth Thors ’83, and Rex Thors ’19. Alan Booth has been inducted into the Dartmouth Athletic Hall of Fame. The sport was rowing, which he first took up at SPS as a Halcyon in 1949. Our 65th Reunion will be held Friday, Saturday, and Sunday, May 31-June 2. Save the dates and plan to join us. Call the Holiday Inn now to reserve your room at (603) 224-9534. We’ll be guests of the School for cocktails and dinner both evenings. More details to come. Until then, let me know your plans, check our website for updates (www.sps.edu/1954), and send in a formnote for the next issue of Alumni Horae by January 10. Allen Ayers ’58, honoring fellow Vietnam veterans Hunter Shotwell ’58 and Al Lyon. 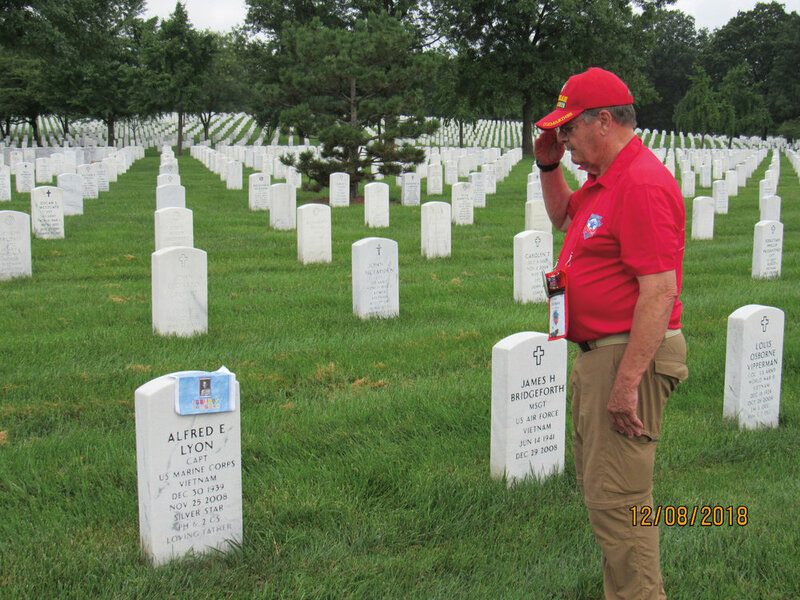 From Allan Ayers: “I was recently selected to take the Veterans Honor Flight from Lake County, Ill., to Washington D.C. This is an event to honor Korean and Vietnam veterans (WWII vets have all been so honored). Since I had done most of D.C. before, including all of the war memorials, I was looking for a way to do this trip in a memorable way and decided to use it to honor two warriors who sacrificed far more in their time in Vietnam than I did – Hunter Shotwell, reflecting on him after our 60th reunion memorial service, and also a good friend of mine, Captain Al Lyon, USMC and my true war hero, also a Silver Star recipient. (L. to r.) Bill Eldridge ’59, Bill Matthews ’61, and David Atkinson ’59 at the memorial service for Jimmy Gibson ’59. 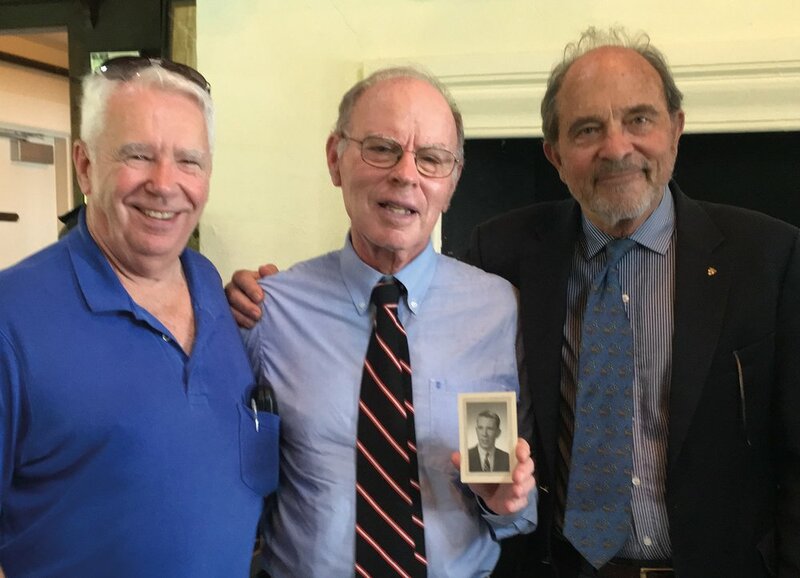 David Atkinson, Bill Eldridge, and Bill Matthews ’61 attended Jimmy Gibson’s memorial service in York Harbor, Maine, on August 16. David brought a picture of Jim that Maria Walker had given him the night before, on the card that Jim had given John Walker (former faculty) when he graduated almost 60 years ago. The note on the back said, “Join me for a drink next time you’re in D.C.” True to style.